Meet Benny. 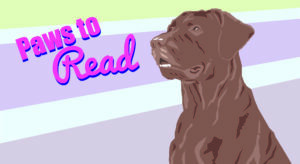 The black Labrador retriever is Elkhart Public Library’s new guest star for Paws to Read. The popular Saturday morning program pairs young readers with a therapy dog to help kids gain confidence in reading aloud. This school year, the program will take place downtown library every fourth Saturday of the month, 10 a.m. to noon. Jeannine Seggerman and Benny have been together for several years, continuing to train together to help and serve others. “He has trained in many areas to be certified a therapy dog,” Seggerman says. Seggerman, a retired first grade teacher from the Edwardsburg school system, says reading comprehension is a cause very dear to her. ”Reading is something that is the most important aspect of their life, so some of this is about enticing children that maybe haven’t been to the library to come out to the library,” she said. Benny takes over for Barney, a St. Bernard who retired from Paws to Read in the spring due to his advanced age. Though a different breed and with a different owner, Benny has many of the same kind and thoughtful characteristics as Barney. Seggerman says she is excited to work with children again, as typically the pair work with the elderly. Overall, she just wants to help children learn to read and encourage people to get involved with their library. A 15-minute reading session can be reserved by calling 574-522-2223. Paws to Read dates for the fall are Sept. 22, Oct. 20 and Nov. 17.